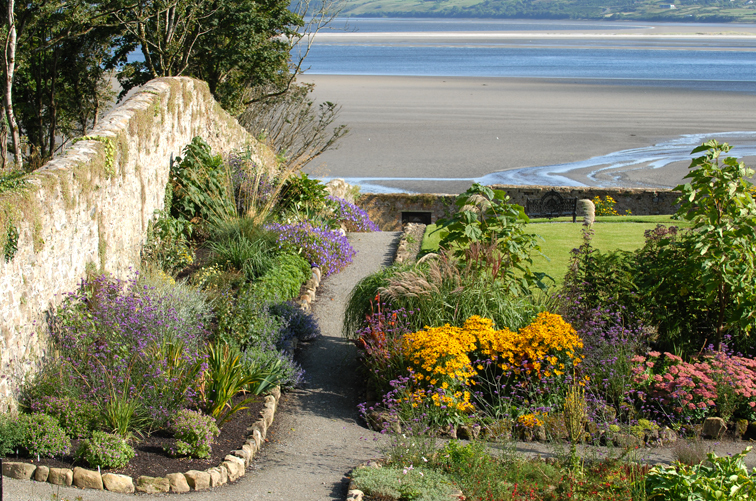 “The garden at Lissadell presents an extremely beautiful and picturesque appearance, comprising as it does all the choicest of the alpine plants. I, for one, shall never forget so brilliant a picture”. This two acre garden has been wonderfully restored since 2004, when it was completely overgrown, having been neglected for over sixty years, when nature was allowed to run its course and it became an impenetrable jungle. Today the Alpine Garden is a magnificent tribute to all the gardeners who have worked in it since its creation in the 1740s, in particular the industrious Sir Josslyn Gore-Booth, brother to Constance Markievicz, who created the stunning Alpine rockeries in the 1890s, and who exported seeds and bulbs from this garden all over the world; and to Sean O’Gaoithin and Jimmi Blake who led the reconstruction work, and to Pat Curneen, Rachel O’Sullivan and Carl Dacus. 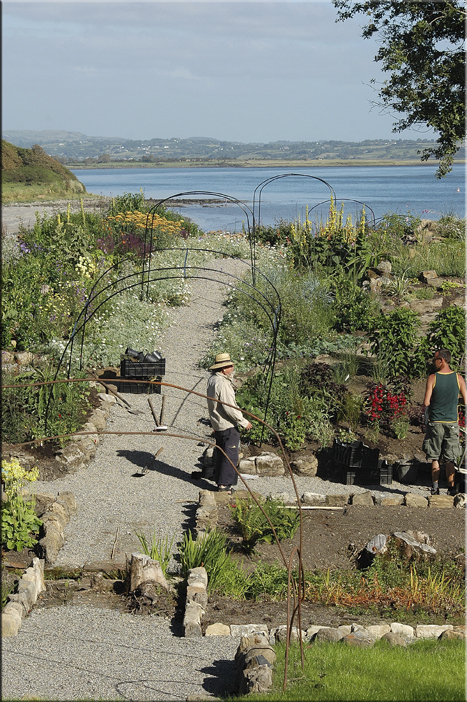 Carl remembers that “there were very extensive records of the gardens prepared by Josslyn Gore Booth from the heyday of Lissadell. However, when I actually visited the garden I was overwhelmed by the enormity of the task that lay ahead.The gardens at Lissadell House had been unattended since the 1950s. The first to be brought back into cultivation was the 2.2 acre vegetable garden which is ably managed by head gardener Dermot Carey, and this garden is well worth visiting.I decided to take on the Alpine Garden project and in consultation with Brian Wood of Murphy and Wood Garden Centre, a list of plants was chosen that would in short order provide good ground cover. The revêtment beds at the top of the garden had originally been planted with alpines but a decision was made to plant them with shrub roses inter-planted with Russian sage (Perovskia), catmint (Nepeta) and Lavender. During the summer months further plantings of shrubs and herbaceous were made. Throughout this project the energy and on-going enthusiasm and commitment of Eddie Walsh his wife Constance Cassidy has been phenomenal. 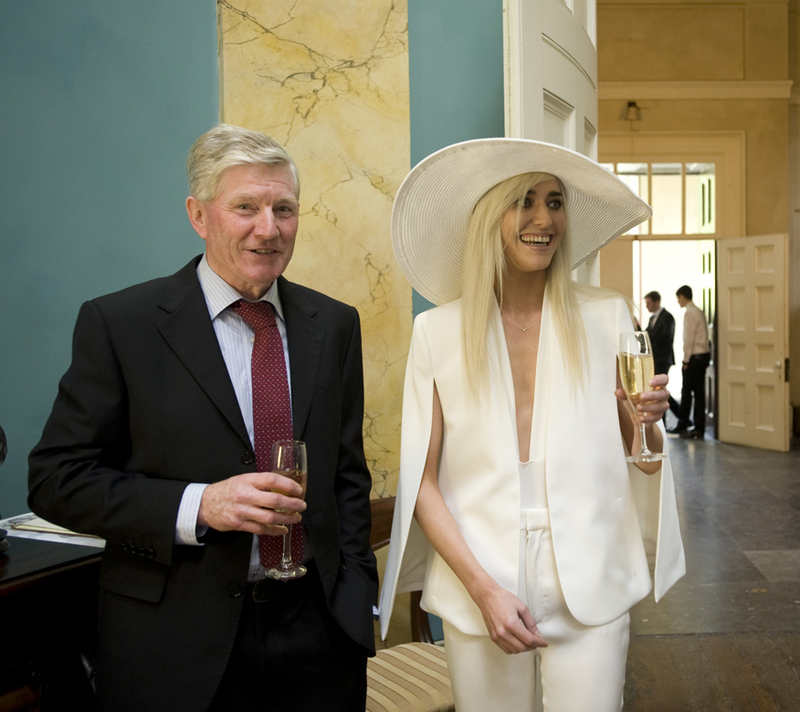 Rachael O’Sullivan, a former student of the Dublin School of Horticulture, started working at Lissadell in the beginning of April 2007 where she worked in the alpine garden with Pat Curneen. Rachel takes up the story: “the original function of this walled garden was to serve as a kitchen garden to the eighteenth century residence of the Gore Booth family at Lissadell, which was located adjacent to the southeast wall of the garden. The house was demolished in the 1830s and at this time the function of the garden changed to become purely ornamental. Nearly all of the features present in the garden today date back to the time of Sir Josslyn or before. The topography of the garden is quite undulating, very unusual for a walled garden. The lower portion of the garden comprises a series of large rockeries constructed of local stone. 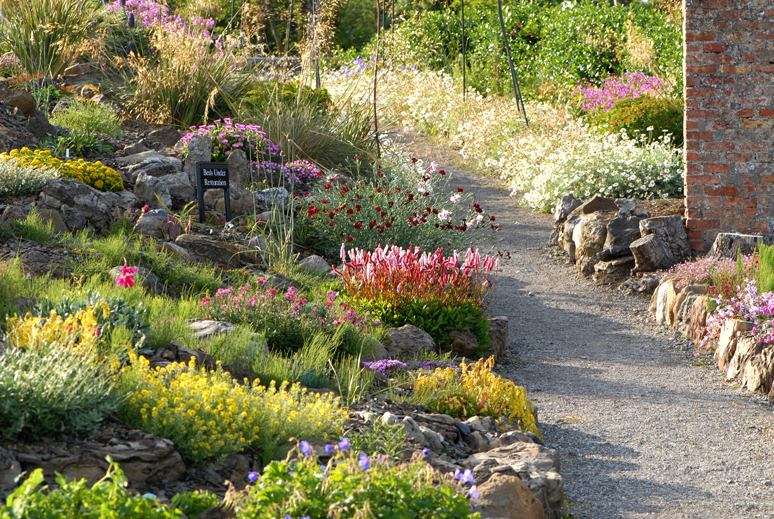 The rockeries cover an area of approximately 0.6 acre and follow the natural uphill slope of this portion of the garden. More rockeries are located at the top of the inclination, as well as the ‘Daisy Walk’ and an old Escallonia macrantha hedge. 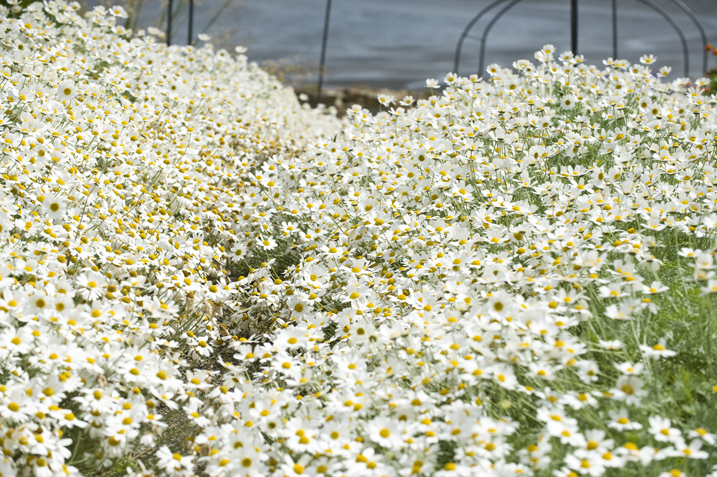 The ‘Daisy Walk’ is so called as the path is bordered with the profusely flowering Anthemis punctata subsp. cupaniana. The beds on either side of the path are narrow herbaceous borders. Old iron arches still survive here and provide structure over the path. The path leads down a hill towards the three interlinking ponds, bordered on both sides by vibrant herbaceous borders. The slope rises again from this valley towards a sloping lawn, containing sixteen island beds, and two revetment beds. A fernery survives along the northeast-facing wall”. The Sunday Times’s Emma Philbin Bowman was also impressed by Jimi Blake’s work. She dropped by in July 2006, and spoke to Jimmi: “I wasn’t trying to perfectly re-create the old alpine garden. What I wanted was to make the best use of one of the best walled gardens in Ireland for growing plants. What makes the garden so special is the microclimate — it’s really mild and balmy. It’s in a bay and doesn’t get much frost. Rachel had a different brief: “the first task to be undertaken was to plant up the rockeries. Carl Dacus of the Dublin School of Horticulture and Brian Wood of Murphy and Wood Garden Centre in Dublin were on board to help with the sourcing and layout of the plant material. On the day we began work on the rockeries, there were some 2,500 alpine and rockery plants waiting to be planted, all lovingly picked out by Carl and Brian. Carl was on site with us for three days of that first week so it was full steam ahead! On hand to help out with the planting were Nova Gadsby, Tadgh Murphy, Isobel Cassidy and Eddie Walsh. The rockeries are quite large and form a network of hills and valleys, with a series of narrow paths meandering through them. They were contructed by hand over a three-year period, between 1907 and 1910, using stone sourced from the local area. It was obvious that great thought was put into the design and construction of the rockeries. The overall layout of each of the rockeries consists of numerous planting pockets. The soil type is mainly a sandy loam, but in some pockets it is evident that the soil type was changed to suit the plants to be grown. In some areas extra grit has been added, while in others the soil was quite heavy. A peat loam was evident in certain places. Some clearance work had to be carried out before planting could begin. Wild garlic had become prolific through the rockeries so as much as possible was dug out. Japanese anemone (Anemone japonica) had colonised one whole rockery, so the decision was made to ignore that rockery for the moment, as repeat spraying would be necessary to clear it. The aim of the initial planting was to give quick cover and quick colour, so plants that would fulfil this were used in large numbers, such as species and cultivars of Campanula, Helianthemum, Gypsophila, Aubretia, Geranium, Armeria, Dianthus and Lampranthus. Shrubs and grasses were used to provide permanent structure in the rockeries. Carl Dacus visited some specialist alpine nurseries and provided us with a lovely selection of plants not widely seen in Ireland. The rockeries now hold approximately 300 species and cultivars of plants, a mix of alpines, perennials, shrubs and conifers. A very large range of spring flowering bulbs have been planted in the rockeries over the last two years, including many varieties and cultivars of Iris reticulata, Tulip, Narcissus, Crocus and Muscari. Brian Duncan provided us with many beautiful miniature Narcissus bulbs, all of which are planted throughout the rockeries and will flower for the first time at Lissadell in Spring 2009. One of these miniature Narcissus is actually a bulb that was originally bred by Josslyn Gore Booth at Lissadell, called Narcissus ‘Mite’. The Crevice Garden: this sheltered area provided the perfect location for a crevice garden. The aim of crevice gardening is to provide a suitable habitat to plants that naturally grow in deep cool crevices. This feature would allow us grow an even larger range of plants. We began work on the crevice garden in October 2007 with the help of Jimmy Currid andStephen MacSweeney. The soil from the frames was dug over and much of it was removed. The stones were laid in rows running in a southeast direction, so that we could fully utilise the aspect. The spaces between the stones were back-filled with a mix of grit and soil. The plants required are specialised for these growing conditions, and were sourced by Carl Dacus in Aberconwy Nurseries in Wales. Rachel on the soil: “during the re-development of the Alpine Garden we have been extremely lucky with the quality of the soil. The texture, structure and fertility of the soil have meant that the plants have become established very quickly. In some cases, particularly with some of the plants in the rockeries, the growth rate was phenomenal. Some found it hard to believe that the plants were in the ground only a short time. The soil, having been left undisturbed for so long was technically virgin soil and all the nutrient that had built up over the years was just waiting to be used. We know that this nutrient level will balance out in time and that the day will come when we will have to start feeding some plants, but for now the soil is doing a fantastic job”. Ancient drainage: “all the work in the garden must be done by hand. Another issue we have encountered in the garden is drainage. With the lie of the land, water naturally flows down from the field above the garden under the wall and into the revetment beds. From here it would flow down one of the paths, eroding a channel down the middle and taking the pea gravel from the path with it. When digging out the beds in this lawn, Pat Curneen discovered that there was a network of old stone drains running diagonally across the lawn at regular intervals. Many of these have become blocked over the years, but some still function and feed water into the ponds. We replaced one such drain that had blocked up with a land drainage pipe beneath the lawn. This remedied the problem. The herbaceous border at the base of the lawn was also prone to water logging as a result of the water running off the lawn, so we created a drain at the base of the lawn”. “Despite the challenges it is very satisfying to stand back and see the results of the work that has been put into the garden. The plants continue to thrive as the garden slowly matures. The most enjoyable part is hearing the positive comments from a person seeing the garden for the first time. It is a very special garden and deserves to be recognised as such. The mild climate of the local area allows many plants to begin flowering early in spring and extends the season of interest into late autumn. The scope of the garden continues to grow with naturalistic planting taking place in the margins of the adjacent woodlands. Thousands of spring bulbs have been planted throughout the woods to add to the natural beauty of the woodland walks”.